Well, Kiddies: Chanukah’s over, Christmas is only a week away, and I’m knee deep in holiday euphoria. I’ve been listening to tons of xmas music. Everything from The Ronettes Christmas, to A Very Special Christmas to Christmas Remixed. Andy hates listening to the same old xmas shlock every year, so he finds the most obscure remixes, like Santastic Mashup, to keep it feelin’ fresh. I love it. It’s been a busy holiday season this year, what with the writers’ strike depriving me of my social life, Katie Holmes pulling a Single White Female on baby Suri, and the shocking news of Jamie Lynne Spears’ pregnancy! Whoa… But I’m ready to get down to business, and talk Christmas. I’ve got most of my Christmas shopping finished. I’m sure I’ll freak out at the last minute and decide to buy something else, but it’s cool, because giving presents is almost as fun as getting them! 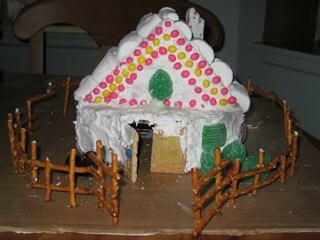 And I’ve been doing lots of decorating, including making a stunning Gingerbread House last night. Behold! Fingerless Gloves. I have a pair already and I love them, but these gloves by Zero + Maria Cornejo caught my eye. First of all, they’re cashmere (yum), they’re elbow length, and they’ve got ruching down one side for that ultra chic look. 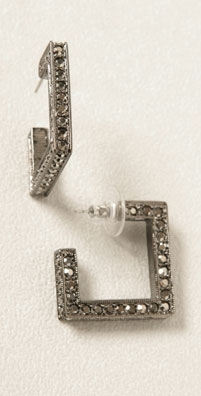 Super cute hoop earrings from Kenneth Jay Lane. I asked for these for Christmas—think I’ll get em? (hehe) They’re simple enough to wear during the day, but flashy enough to wear for a night out. 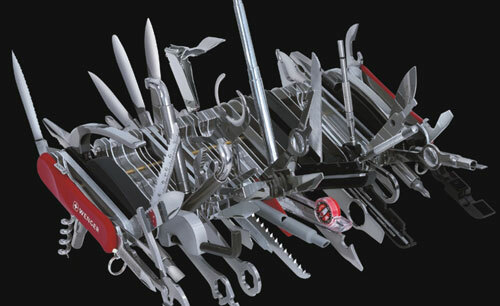 For that special guy in your life: the most insane Swiss Army Knife ever. It has 85 tools and over 100 functions. Seriously, who needs all that crap? (Probably my dad, but I’m not spending $1,200 on a frigging pocket knife). A Swarovski USB flash drive, because who doesn’t need a little bling when they’re storing memory? I love this clutch by Seril. It’s called the “knockout clutch.” Come on, how cute is that? I know this bag is overly trendy right now, but it’s fabulous. I want one!!! Different Like Coco. I don’t think I know any kids, but I’m a Young Adult writer, and I love fashion, and this book looks AWESOME! Who wouldn’t want to read an illustrated biography of Coco Chanel? And after you’ve done all your Christmas shopping, don’t forget to do a little charity work. Check out FreeRice.com, where you can practice your vocab while simultaneously donating rice to the UN to end world hunger! Cool, right? Okay, this is probably my last post before xmas. My parents just got into town, and we’re having a party, so there’s boat-loads to do around here. 27 Responses to I heart the Holidays. Look at that Swiss Army Knife! MY GOD! JUST LOOK AT THAT THING! Can we say overload?! DAMN! Talk about hyperbole! I think Katie Cruise is now a robot, an android. I had a post not too long ago on her with that hair, and she just creeps me out. Stepford wife anyone? Scientology is a very damaging cult I see. Have a great Xmas and here’s to a great 2008 and Britney’s new role as an aunt. I love the clutch, its so adorable and you can stick your fingers in it! There is something similar on etsy made with brass knuckles that I want oh SO badly. I also want that coco Chanel book, it’s brilliant! If I had a little brat, for sure thats all she would be allowed to read, ha. ooo skillful gingerbread house alex, are you gonna eat it or let the sugar crystallize haha? cute chanel book i want it! Jamie Lynn pregant a real shocker actually not but have a great Holiday! JAMIE LYNN SPEARS OS PREGNANT? She’s sixteen! uh, what, you mean youre not sending it over to me for christmas? good luck on your wishlist! no. I do not need bling when flash-driving. But it does look pretty cool. Merry Christmas! Have fun with your family!! it won’t be that swiss army thing. Have a wonderful Christmas, Alex. I also heart the holidays! I love all the deliciuos food! I have been out of the Christmas spirit since the Jamie Lynn saga…seriously my bubs is scared, he can;t understand why I care….and I wish I knew why too. that knife is cool….funny thing the only thing I own from Tiffany’s is a Sterling Silver Swiss Army Knife. have a very merry christmas darling girl!! Wow! Merry Christmas Alex! Your gingerbread house is beautiful! What a fabulous idea for the fence. I’ll use that myself (making mine on Sunday) – I mean, wow! “Katie Holmes pulling a Single White Female on baby Suri”. Ha. so true. I actually like katie’s haircut, but it ages her by about 20 years. and i love love love your gingerbread house! the pretzel fence is adorable! i however never have the patience to make one because they are so time consuming, but i love yours! omg i kno christmas season is sooo busy! today was the last day of school, leaving very little time to actually savor the holiday! yea i just put up my last post before xmas as well – the christmas season is just tooo short in my opinion! Hmm. I think we all freak and procrastinate in holiday shopping. I know I do. p.s.hope publicity for your book is going well.if you have time check out my new post.happy holidays! I definitely need a bling thumb drive! And I actually asked for a pocket knife for Christmas…here’s hoping I get it. The only thing I really need on a Swiss Army knife is a corkscrew. Which begs the question, why don’t I just carry around a corkscrew? I guess I need something to cut slices of the Dubliner (my favorite Irish cheese to go with the wine:). Hope your still having happy holidaze! and you continue to amaze me. I tagged you today on my blog. It’s completely voluntary, of course, whether you’d like to continue the tag. Hugs. Just wanted to add that I love free rice.com since I found out about it a few months ago I think I’ve donated like 5,000 grains It gets a tad bit adictive especially when you are suppossed to be typing a lab report! That knife looks scary but I’d probably want it around on outdoor activities…useful little things, they are. The bling-y memory stick, on the other hand…. I know this is way belated, but- happy holidays! I hope you’ve had a good time. hahahaha its okay i have my blog as my home page and it scares the crap outta me every time! 😀 happy new year to you too! 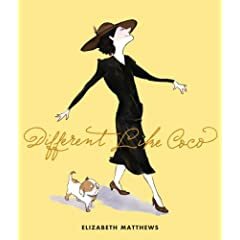 I would LOVE to read an illustrated book about Coco! Just when you think the purse can’t be reinvented- blam! Finger holes. But fingerless gloves will never do for my tiny carrot stick digits.